We have all been there. You bought this great electronic device from e-bay, but the only thing you cannot put up with is the cigarette smoke it still carries from the previous owner. And you can’t figure out how to rid the reeking tobacco smell. It could be a phone, a laptop, stereo system or any other piece of electronic that is pushing your buttons with insufferable cigarette smell. So how do you get cigarette smell out of electronics? It is a catch 22 situation for if it is a well-functioning device for which you got a grand bargain, sending it back to the seller sounds out of the question. Electronics are just delicate equipment, and it can be a risk to crank them open and cleanse with a liquid. For that reason, this post explores two methods for removing tobacco smoke from electronics. The first method requires the use of cleaning fluids and a little bit of DIY experience while the second method entirely relies on the good natural air. But note: All the two methods require carefulness and patience. And when it comes to cleaning electronics wit fluids, avoid using corrosive acids and caustic liquids. Also, take care not to flood the electronic with fluids. Simply select a method you are most comfortable with for your phone, tablet or computer. So let’s get started. If you can’t take the tobacco smell on your electronics anymore, then get to work. Start by disconnecting the electronics from the socket and powering them down. It is recommended to power them down at least an hour before the cleaning. Strip the casing and the screen protector. Remove the battery. Removing an inbuilt battery might require unscrewing the fasteners on the back of the device. You have now done a great to disassemble your device (at least to a level where you can quickly put everything back without any technical help). The cigarette smoke residue couldn’t have gotten any further than that. The detox starts with vinegar to break things up. White vinegar, which is readily available in our home, is the perfect candidate for this job. Pour a quarter glass of white vinegar and mix with the same amount of distilled water to lessen the acidity. Stir the solution till it’s thoroughly mixed. Lightly soak some cotton swab or unused earbuds in this mix and proceed to wipe the surface of your electronics slowly. Don’t over saturate the swabs, and avoid areas of the electronic which have exposed circuit boards or other bare components. Slow and steady is the way to succeed at the task. If the smell of vinegar does not tickle you, lemon juice could be a better option. The cleansing and non-corrosive acids in lemon juice and vinegar can help to expel cigarette smoke from your electronics. 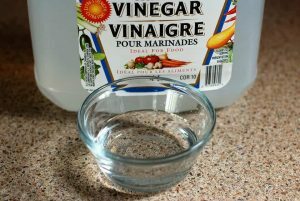 The next step after cleansing with vinegar is giving an alcohol retouch. Dab the cotton swabs in alcohol making them only slightly wet and proceed to wipe the inner parts of your electronics. Take great care not to over-soak the gadget with alcohol and avoid wetting the circuit board. The best thing with alcohol is that it evaporates quickly and after a few minutes your phone will be completely dry. You are right to have your reservations about cleaning an electronic gadget with liquids. It is an activity that could go sideways if moisture gets in the wrong parts. The big news is that you can also effectively remove cigarette smoke from your device just with the use of fresh air. Letting air circulate over the exposed device is enough to dissipate the awry tobacco scents. No pressure there, but you can also use an Ionizer Air Purifier. Unplug your electronics from the power source and power them down. For an interconnected stereo system, it is advisable to unplug and disconnect at least a day before cleaning. Strip down the covers. Depending on your device, you will have to carefully study it to find out where the cover attaches to the electronic components. Get ready with your screwdriver to unfasten the bolts. Unscrew the bolts that attach the covers to the device and save them in separate bags where you can easily access them when reassembling everything back. Spray the exposed electronic components with a burst of compressed air to blow off dust and cigarette tar. Hold the compressed air bottle at a safe distance so that you don’t blow loose electronic parts with the excess pressure. Set the open electronic components out for decontamination with fresh air. Place it under an umbrella or any sort of canopy away from direct sunlight. Fresh air helps to remove smoke odors without having to use vinegar. You can also achieve the same effect in a properly ventilated clean room using an ionizing purifier. Set the exposed components in a room and turn on the purifier. The ionizer works by releasing negatively charged ions into the air. These charged ions attract and attach to the positively charged particles that include smoke, dust, and bacteria among other pollutants. A bond is formed, and the resultant formulations fall to an electrostatic collection plate. Use wet wipes to clean the metal or plastic casings of the device to remove smoke deposits. Clean the ventilation in holes with a cotton swab soaked in alcohol. The casing and cover parts can safely be cleaned with alcohol or any other liquid cleaner and dried with a towel. Allow the disassembled components to air out until the cigarette smoke smell dissipates. That could take a while, depending on how much the device was exposed to smoke. It can be anything from a few days for smaller devices and a week for stereo components. Reassemble the electronic components back into the casing and fasten the covers with the screws you saved. So, hopefully, the vinegar and air purification bit worked. If the tobacco smell persists, you might want to do a �charcoal filtration.’ Put a few charcoal pieces on a wire rack and your electronic gadget underneath, or you can use a small bag to separate the device from the charcoal. Let the electronic device sit in that position for about a week while the charcoal absorbs all the cigar smoke smell. Wham! Now you have an odorless electronic device, saved from days of putting up with reeking cigarette stench. At this point, you realize it was such an easy task, and more reasonable than returning the device to the seller or trashing it.